This kit depicts the famous 787B nr.55 that was driven to overall victory in the 1991 Le Mans 24hrs race by Johnny Herbert, Bertrand Gachot and Volker Weidler. 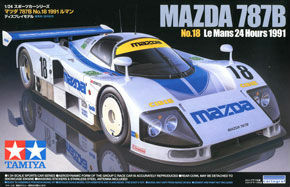 A fully detailed kit, this must be the nicest kit Tamiya made sofar of any Mazda. Although the doors are molded shut with the front body, the interior and monocoque details are so good that you'd be very tempted to cut open at least one door. Fortunately, the engine cover does come separate so the well detailed engine and rear suspension can be displayed. The body has very fine raised lines on the borders of the orange/green patches, this is really neat since on the real car the green patches are applied with thin adhesive foil, so you actually see a fine line shining through the white stripes. The box art is a true piece of art, showing details that aren't even included in the kit. Best of all, it is accurate enough to use as a guide for further detailling and can also be used to determine what parts are reinforced with carbon/Kevlar fibre material and what parts are reinforced with full carbon fibres. The kit comes with two sheets of decals, one containing all white and green parts of the color scheme and a smaller sheet containing all smaller details. For touching up any green parts of the scheme, Tamiya X-28 Park Green is a close match. This model was rereleased in 1999 by Tamiya's factory in the Philippines. One nice touch with the rereleased version is that sheets of protective paper are carefully stapled to both decal sheets, so the decals won't stick to instruction sheet, box or parts bags (Tamiya subsequently started putting the decal sheets in protective bags in all their kits). Both Modeler and Studio 27 jumped the bandwagon by releasing etched stainless steel detail/upgrade sets and Studio 27 also released no less than 4 different sets of decals allowing serious modelers to recreate all of the 787 and 787B liveries ever driven. This model was rereleased in 2004 by Tamiya's japanese factory, this time the two decal sheets were replaced by a single high quality sheet printed by Cartograf, this is indicated on the box top and on the short edge. The price of this rerelease went up to 2400 Yen but the quality of the decal sheet makes up for that. At the same time as this rerelease, Studio27 did a fresh run of three of their 787B decal sets and of their etched stainless steel detail/upgrade set and Acu-Stion released a new etched stainless steel mechanical parts upgrade set. Despite the availability of aftermarket decals this is a very welcome release. 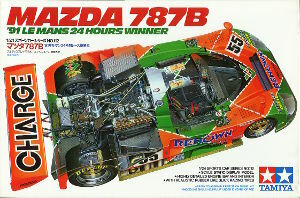 The Nr.18 car was 787B chassis nr.001 and was identical to Nr.55 787B chassis nr.002, so the contents of this box differ only slightly from Tamiya's previous 787B releases. New parts are new decals, a length of steel wire for the roof top antennae and a set of masking seals for the cabin windows. The instructions contain new painting references as the Tamiya paint range now includes more shades of metallic paint than it did 20 years ago. The 'component replacement' mentioned in the history on the instruction sheet involved the righthand drive shaft which took 16 minutes to replace (hats off to the mechanics as the righthand side is where the seriously hot exhaust system is located ! ), dropping the Nr.18 car from 5th down to 7th place. The instructions start by telling you to sand the finely raised lines off of the body, these lines were molded on to mark the boundaries of the green and orange parts of the Charge/Renown color scheme. On the flat parts of the body I'd prefer to carefully shave the lines off using a hobby knife with a brand-new blade. During the Le Mans race different covers for the front wheels were fitted which were either white, aluminum or pale metallic blue, with some of the pale blue sets having white 'Volks Racing' lettering. There is a nice picture on the side of the box showing a completed engine bay, do note that the spark plug boots of the uppermost plugs and the pair of boots in the middle of each triplet of ignitors (i.e. the one second from left on part B29 and the separate part B30) should be dark grey/black instead of blue. You can find a picture of an actual 26B engine on my Car Reference Gallery page. Some more useful pictures of the 787B engine bay can be found with an interesting story on restoring 787B chassis nr.002 at UrbanRacer.com . The very well detailed decals are printed by Cartograf and it looks like they got the colors absolutely right, including the yellow strip across the top of the windshield: at the technical inspection before the race a dayglow yellow strip was applied, during the actual race a non-dayglow yellow strip was carried. The Studio27 decals offer a dayglow yellow strip, the new Tamiya decals offer a non-dayglow yellow strip. The new Tamiya decals also include some carbon-Kevlar weave print for the exposed parts of the chassis. Body, wheels and chassis parts are molded in white, cabin interior and engine bay parts are molded in black.